FlyDubai is starting its Dubai-Helsinki (Finland) flight from October 2018. With this, Indian passengers can now fly to Finland capital for a relatively cheaper price of 34-35k INR. 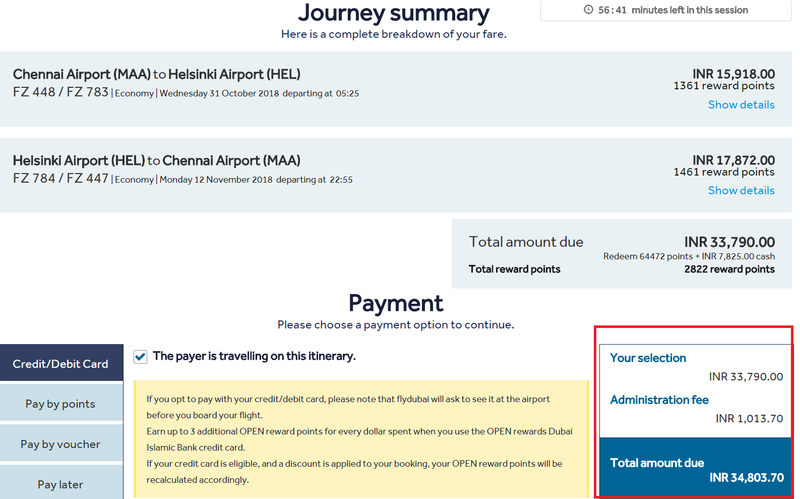 A ticket to Helsinki from various Indian cities typically costs about 45-50k for return. Even from Delhi, which has direct flight to Helsinki, the cost is often around INR 40000 upwards. Compared to these, flyDubai is now offering an option which is 10-20k cheaper compared to next best option. Please note that this FlyDubai fare includes 7kg cabin bag and 20kg check-in bag and an option to change travel date (at a fee), it doesn’t include food and entertainment (like some full service airlines offer). Still a savings of 10-20k is tempting enough to consider FlyDubai over other airlines. Given that WOW air is offering a Delhi-US/Canada for just 27000, a return fare to Europe around 20000 would have been extremely tempting. However till that happens, 34-35k is still reasonable. While above shown fare is from Chennai to Helsinki and back, similar fares are available for Mumbai-Helsinki and few other cities (Delhi, Mumbai, Lucknow, Kochi, Hyd) in India from which FlyDubai operates. Do check different cities and date combinations till you find a return fare around 34-35k. There will be an ‘administrative fee’ of about INR 1000 in the final page, on top of the fare you see in initial screen. Check-in bag, cabin bag included. Meals, insurance and other services are extra. The Dubai -Helsinki leg will be on the new 737 Max 8 aircraft [Checkthis post for my review of FlyDubai’s new 737 Max 8]. This new aircraft has economy seat with adjustable headrest and business class with 180 degree flat folding seat. Below is a pic I had clicked of Finland’s Ambassador to UAE, explaining Finland to journalists attending Arabian Travel Market 2018 in Dubai last month. Be advised that winter will commence in Helsinki in October-November- not the best time of the year to visit. If you wish to enjoy snow or winter activities you can plan in this duration, else select a date March 2019 onwards. Of course, you can keep Helsinki as a base and fly to various schengen destinations all over Europe with your Schengen visa. From Helsinki you can take a ferry to Estonia (Estonia has free public transportation), or even visit St Petersberg (Russia) without a visa. Helsinki airport transfer: You can either buy a Helsinki card (around 60 Euros) that includes free public transport OR buy a single journey ticket or a 2 day bus & tram pass (Was around 18 Euro when I visited few years ago). Both these are valid for ferry to Saumenlinna island as well. The bus pass is valid for 48 hours from the moment of purchase, not just the calendar days, so it is great. Fly to Kerala for price of bus ticket-GoAir Deal!